The quince is a beautiful flowering tree with pale pink blossoms. The dark green leaves turn yellow in the fall. After the leaves have dropped, the gnarled, twisted branches remain as an attractive winter accent. The trees need minimal pruning – enough to promote a desired form. Quince trees are susceptible to the bacterial disease fire blight so we recommend using low amounts of nitrogen fertilizer since lots of lush new growth will promote this disease. The fruit is rather tart and very fragrant. It contains a high pectin content which makes it especially useful for jams and jellies. Quince is very compatible with apples. Adding quince to apple sauce will give it some extra zip! Peel, core and slice 2 quinces and 3 apples. Place the slices in a buttered casserole dish and sprinkle with ½ cup sugar. Pour ½ cup water over the mixture and scatter 2 teaspoons grated orange peel over the top. Cover and bake at 375 degrees for 45 minutes to 1 hour until tender. 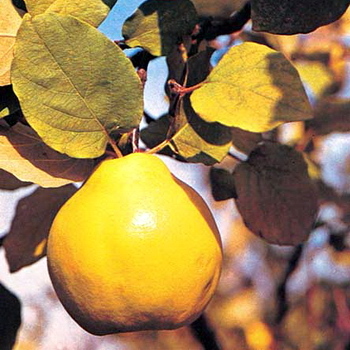 Heavy crops of large, golden yellow quince with white flesh and slightly tart pineapple flavor. Used in baking, jams and jellies. Profuse ornamental bloom with large white flowers tinged pink. Cold hardy, yet low chilling requirement. Ripens September to October. 100 hours. Self-fruitful. Available on Quince.